Sketch K Showing the Progress of the Survey in Section No. XI (upper sheet) from Tillamook Bay to the Boundary from 1850 to 1857. 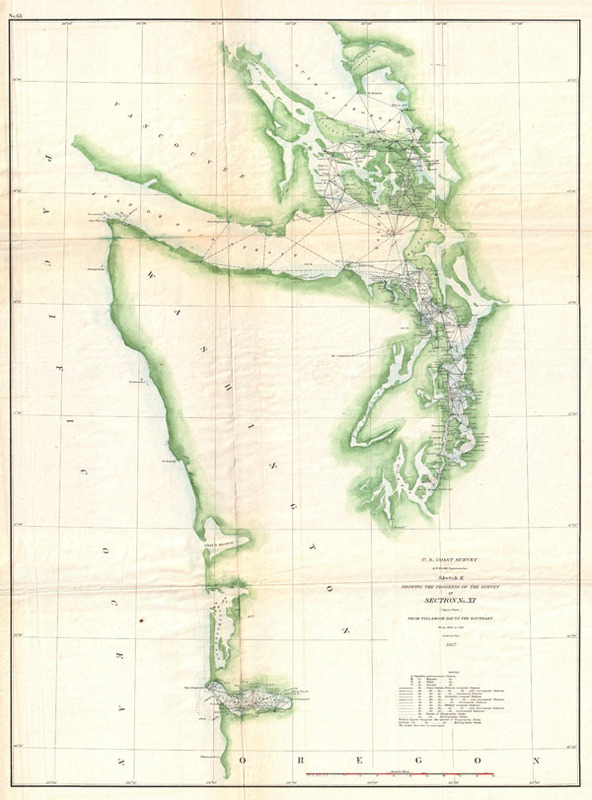 An uncommon U.S. Coast Survey map and triangulation chart of Washington, Vancouver and the Puget Sound. Details from the Columbia River North along the Washington Coast to Cape Flattery and Vancouver Island. Shows the Strait of Juan de Fuca as well as Puget Sound and Washington Sound. Names numerous points along the coast though Seattle is not one of them. Prepared under the supervision of A.D. Bache, for inclusion in the 1857 edition of the Report of the Superintendant of the U.S. Coast Survey. Very good condition. Minor toning and wear along original fold lines. Blank on verso.